Forgiveness Sunday And Cheesefare Sunday. The Triodion teaches us how to think. "O Master, Guide to wisdom, / Giver of prudent counsel, / Instructor of the foolish and Champion of the poor, / make firm my heart and grant it understanding. / O Word of the Father, give me words, / for see, I shall not stop my lips from crying out to Thee: / I am fallen, // in Thy compassion have mercy on me." Many people make some sort of resolution when they enter Great Lent. Usually it is something we have not done before, or perhaps done poorly. The one who has fasted poorly in the past may decide to keep the fast better – to not eat any meat or animal products, and some may even be zealous to keep the fast from oil and wine and fish. The one who keeps the fasts may be zealous to not eat anything at all for the first three days of Great Lent, or eat only one meal a day, which, according to the strict typikon, is “after the ninth hour” (about 3 in the afternoon). In my pastoral experience, most people make some sort of fasting related resolution. I applaud their intentions, but sometimes their emphasis on fasting obscures for them the real purpose of the fast (it is not fasting! ), and trying something that is beyond their spiritual and physical capabilities sets them up for failure, and sometimes, despair. Even if they succeed in their fasting goal, they miss out on improving themselves in more important ways. Remember: Nobody is saved because of fasting (but those who are being saved fast). There is only ONE important resolution to make for the Great Fast. It is mentioned (in so many words and images) constantly in our services. We will mention that one in a little bit. It is very important to fast, especially for the one who has rarely fasted, but there are more pressing things. It would be better if a person prayed the Prayer of St Ephrem  with attention in the morning and the evening. How many think about fasting, and even buy cool new vegan food from the local yuppie grocery, and do not increase their prayer? This is more important. We need to become more regular at prayer, and pray with more attention. The prayer of St Ephrem is a great place to start. Also, there are extra services in any serious parish during the fast , especially in Clean week and Holy week. If you are not in the habit of going to church except on Sunday, or sometimes on Saturday too, it would be better for your soul if you made the effort to change your habits and attend at least one of the extra services each week regularly. This is much more meaningful (and difficult!) for those who are not in the habit of so much “church prayer” than “not eating till 3”, or “trying to not use oil” during the week. Great Lent is a time when we are trying to change the way we think, and act. We are trying to get less selfish. Many people rarely or inconsistently pray for others. This is the perfect time to decide to give our supplications to God for our loved ones (and especially our not loved ones! ), our family, friends, and our pastor. Praying for others is demanded in the scriptures. We must do it; we need to get very good at it. Our prayer will not be fruitless, even though it may be distracted and not seem to us to be very effectual. We are in training to not think of ourselves, and to love, truly love, others. Prayer with attention is the greatest expression of love. How do we go about this is we are undisciplined in prayer? We must have two things – real honest desire (which will be shown by our effort) and a little planning and organization. Get a notecard and write a few important names on it. You can also use the prayer list we publish and change frequently- it is here: http://docs.google.com/View?id=dzgvjb6_16f2pcdrhn. Of course, we should plan to fast from various foods, but in comparison to our prayer, it certainly must take second place. In fact, the scripture teaches that fasting is in order to increase our prayer , so merely fasting without making other changes is nonsensical from a spiritual point of view. "For our good, for our happiness," … "at least let us give a vow to ourselves, that from this day, from this hour, from this minute, we shall strive above all else to love God and to do His Holy Will!" There are RARE exceptions, when a pastor is unable to support himself without a very inflexible job, and cannot serve services during the week, but for the most part, when you see a church with just weekend services, and even only Sunday services, you would be better off finding another one. Murphy’s law and molebens. Logismoi. How to think about personal intercessory prayer. We all know about “Murphy’s Law” – “If anything can go wrong, it will”. It has many corollaries, and is sometimes funny in context. But it is not funny when applied to real life – and by this I mean our inner life, in which we gain our salvation. There is an “occupational hazard” in the pastoral life, which, I believe afflicts all but the truly humble and perfected. It consists of “Murphy’s law type of thinking – “logismoi” – negative thoughts. I have these thoughts, and they are like mosquitoes – very hard to get rid of – and the best way to deal with them is to ignore them and just keep doing the right thing. My parish needs the weekly Moleben  (and the weekday liturgy). During these, all parish members, and a good deal of others (who visit sometimes/often/hardly at all/are friendly to our community/have asked for prayer) are commemorated by name, three times. I have recently become aware that people I have been praying for with intensity for the people on my daily dyptichs for quite some time have had marvelous things happen in their lives. I would never say what, because I keep so many secrets that I may not even tell you if it is raining outside if you asked me – and it is not like angels have started singing in heaven, but I have seen real things happen that have comforted me. How to think about personal intercessory prayer. I have a “code” when I think about my intercessory prayer for others. 1. I MUST do it, because I am a Christian, and the defining characteristic of a Christian is love. Those who love think of those they love, and try to help them. Prayer should be the first, the middle and the last thing we do for those we love, and if it is mixed with other things because of contact with them, so much the better, but we should think ourselves totally deficient in loving others if we do not pray for them. I do not think anyone should consider themselves a Christian if they do not regularly pray for others. 2. I have dyptichs  which I keep on the computer, and print off using “Clickbook ”: software in 4 pages to a piece of standard printer paper, so I can cut it up and have it in my pocket at all times. The list includes all parishioners, “sort of” parishioners, friends of the parish, etc. It also includes our public prayer list, which is at: http://docs.google.com/View?id=dzgvjb6_16f2pcdrhn. The goal is to pray for each of these people by name at least once a day. Since it is with me, I can pray in the car, or when at work (or in a train, or in a plane , or in a bus, or here or there, or anywhere!) this list is also used in the Monday Moleben, and the Thursday morning liturgy. With a list, I have a concrete thing to help me remember people. I recommend that everyone would make one. 2. I believe in “KISS”, that is I keep it real simple. I just pray that the Lord would have mercy on those I love and care for. I use the Jesus prayer, since it is so powerful – “Lord Jesus Christ, Son of God, have mercy on _____” . 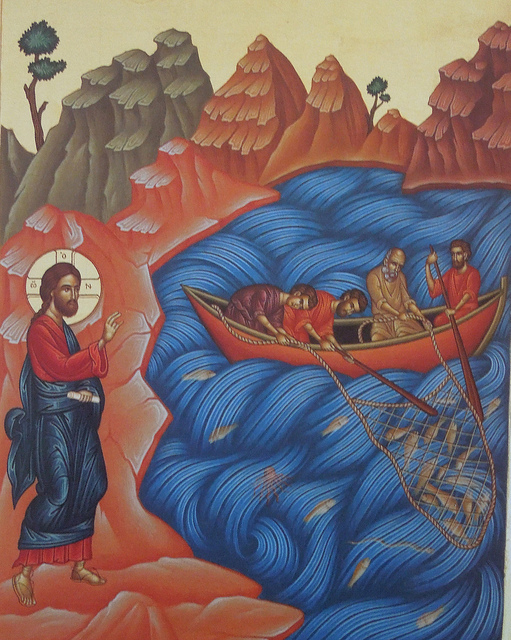 It does not matter if they are sick, going through a divorce, Orthodox, or not Orthodox, it does not matter about anything in a person’s life – we all need God’s help, and nobody knows with exactitude what we need. In praying only for mercy (the Orthodox Christian understanding of it, by the way), the prayer is short, focused, intense (well, to tell the truth, it can be intense, but sometimes it wavers) and non judgmental. 3. Just as I do not know what people really need, except in general terms, I cannot know if “my” prayer was answered. I also do not care. If I thought my prayers were extremely “effective”, I would get proud. I just pray, and rejoice if something happens to the good in a person’s life. 4. Even though I resolutely do not “take any credit” for anything I pray about, I am open to the possibility that God has heard my prayer, and especially my prayer in behalf of my people before the altar as a priest of God. Therefore, I am encouraged to pray more. Back to the logismoi – negative thoughts. Here is an example. The Moleben is not attended by a lot of people. I sometimes pray alone. I have it after a long 14 hour day of work and travel, and sometimes I have a bit of a war negative thoughts when I am going to this service, tired and maybe a little crabby. I have found that I am never sorry I have served the Moleben, and believe with all my heart that the regular serving of it is crucial to our parish’s inner life. There is one part to “Murphy’s Law” that does apply to Molebens and weekly prayer services. If I am late, people are waiting. If I am early, nobody is there, and sometimes I serve alone. This past Monday, I forgot about the service three times, and almost did not go, but God reminded me. I was offered a chance to go to feed the horses with my son Tim, and I will always do this if I can. I said I would be there at 8 pm after work, totally forgetting about my obligation to serve at the church. Later in the day, Tim cancelled, since someone else in his family had already fed them. I was asked to pick up my son Dan at about 7:30 PM from a practice for a play he was in, because my wife was delayed at work. I was ready to do this, and texted him, but he replied that one of my daughters would do it. I was blissfully unaware that these two obstacles to serving the Moleben had been removed, and when I got in my truck to drive home after a long day at work, I somehow forgot completely about the Moleben (it was formerly on Tuesday evening, but my work schedule changed), and I only remembered after ten minutes on the highway. The negative thoughts set in for a short while, but they are just mosquitoes – swat them away and go do what I gotta do. “Moleben” means “Prayer service” and is from the Russian word “molitva” – prayer. It is a short, multi-purpose service which is like a severely shortened matins service, with intercessory prayers inserted. We serve it once a week, with an Akathist, almost always to the Theotokos, inserted. “Dyptichs” means “list”. All priests have personal dyptichs, and all Christians should have them, and USE them. The word also has a serious theological implication. The head bishops of the local Orthodox churches in the world (such as the Patriarch of the Russian Orthodox Church, Kyrill, etc) have an official dyptichs which names the heads of all the local Orthodox churches. If a bishop is not on it, there is something seriously amiss in the canonical relationship of the two churches, or the other church is not even Orthodox. For example, the Pope of Rome is not on any Orthodox Church’s official dyptichs. “Clickbook” ( www.clickbook.com/) is not expensive, and it is awesome. I have no relationship with the company, except that I have used their product to print zillions of booklets, cards and other stuff, especially for the church, for many years. To Pray For Someone More Diligently. Prayer Of St Silouan Of Mount Athos For All People. Audio talk and prayer texts. This is another in our short after liturgy catechetical talks. We discuss 2 prayers that everyone should have for their personal prayer rule. The prayer of St Silouan is especially important. St Silouan prayed for all the people of the world. This is a sure sign of love. We must cultivate habits that build this kind of love. The audio explains a little about these prayers and quotes them. The word document contains these two prayers. It can be printed and cut into quarters to have 4 sheets with both prayers. I pray Thee, O merciful Lord, for all the peoples of the world, that they may come to know Thee by the Holy Spirit. Like anything worth doing, the prayer of St Ephrem takes some practice before we can receive the full benefit. There are bows AND prostrations during the prayer, and a certain number of repetitions. To someone who is accustomed to this prayer, the physical actions and specific repetitions free the mind and penetrate the soul. This can only be understood if it is done, else, a person will consider the prayer to be too complicated, or worse, an example of “vain repetition”, which the scripture forbids. He who has ears to hear, and mouth to speak, arms to make the sign of the cross, and knees to bend, let him understand! The prayer of St Ephrem is said two different ways in church. The best way to say it at home is the “longer” way, twice a day, in morning and evening prayers. If a person is not organized or motivated enough to say formal morning of evening prayers, at least this prayer can be said. As my father used to say, Once or twice, but never “nunce”! May God place in the hearts of our children the things they should know. He tells of a Greek priest he knows who has three sons who are like angels. One is a priest, and the others serve in the altar with their father. This is, lamentably a rare thing: for the children to grow up with the piety of their parents. Fr Zacharias asked this priest why his children were so angelic. The priest replied that he has never taught his children anything about the faith, but since they were little, has had the custom of kneeling beside their bed while they were sleeping for a half hour and praying that the Lord would put in their hearts what they should know. I wish I had prayed more for my children. I have taught them many things – many good things. I have taught them the truth, but I have not prayed at their beds for a half hour every night. The life of this simple priest and his angelic sons is a sobering wakeup. Really, it is all about prayer. We need it as much as we need oxygen, and yet, we do not do it enough, even for the ones we love. Isn’t this a terrible, inexplicable conundrum? If we learn to pray a little better during the fast, it will not be without purpose. May God place in our hearts the zeal and ability to pray. 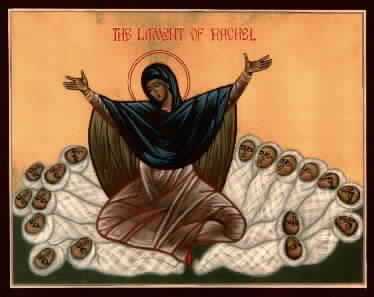 This article is at: http://www.orthodox.net/journal/2010-02-10-angelic-children-fathers-who-pray-for-their-children.doc and on the blog.